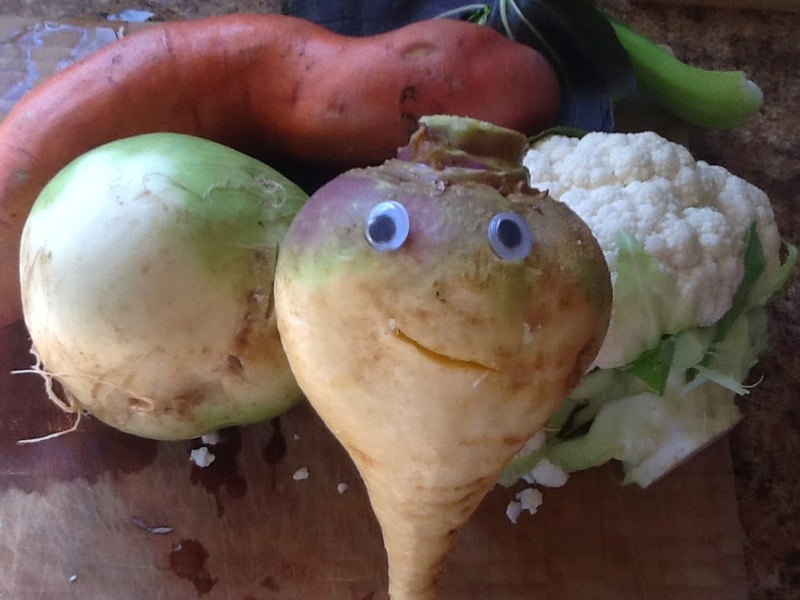 Rutabaga…. prior to meeting the Vitamix. It’s true….googly eyes do make everything better. Our weekly CSA box is delivered on Saturdays and it’s always fun to see the variety of fruits and vegetables. Each of my children have their own favorites that they look forward to with each season. We make an effort to eat foods that are in season, however there are certain items that are in high demand at our home, so we buy them throughout the year. I often get asked how I get my kids to eat their veggies. Simple, just have them available. I don’t agree with “hiding” veggies, unless you want your children to question every food item you make! It’s true, kids, just like grown ups, develop likes and dislikes for certain foods at different times. So, if your child doesn’t care for broccoli right now, offer them something else. Try the broccoli again at a later date. Just don’t push the issue. Watermelon radish, cauliflower, rutabaga, red choi, and sweet potato. Eaten raw or juiced. Offer a variety of fruits and vegetables. Kids will often eat what their parents eat. So, if you only eat carrots and potatoes, how can you expect your kids to like spinach and zucchini? The key here is variety. 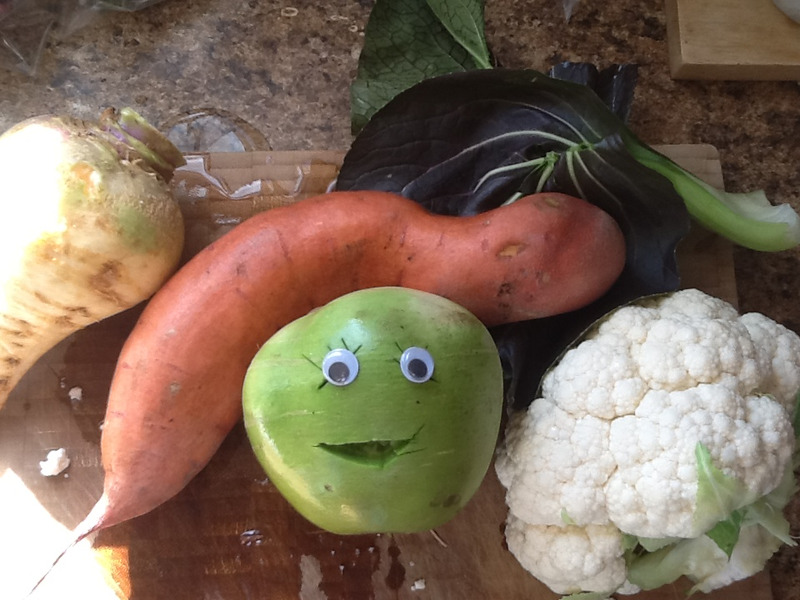 You may be surprised to learn that your child really does like veggies, just not the ones you have been offering. Presentation! This is huge…….put a whole carrot on a plate, it will most likely be ignored. Shred that same carrot and the kids will ask for more! Try shredding, spiralizing, grating, chopping, slicing…..just make it look different. Arranging the veggies on a plate into a simple picture or sculpture can also inspire little ones to snack on the artwork. Teach your children to cook-have them help in the food preparation. Not only is this an important life skill to learn, but they will feel proud of the fact that they helped out. And they may just want to taste the creation they helped put together. Try juicing fruits or veggies, let the kids experiment with flavor combinations. We use our Vitamix for juicing. Make sure your children know where food comes from. Real food that is grown on farms-not from stores and factories. This is an important lesson on making good food choices that will benefit your children now and later in life. Foods that are “real” are items that usually have a shorter shelf life, have the ability to spoil and offer optimal nutrition. Foods in their most natural state are usually the most nutritious. Experiment with raw and cooked foods, see which ones your children prefer. Healthy eating should be an enjoyable event. Create wonderful memories and establish fantastic associations with healthy eating…..It will not only benefit your children throughout their lifetimes, but yours as well. 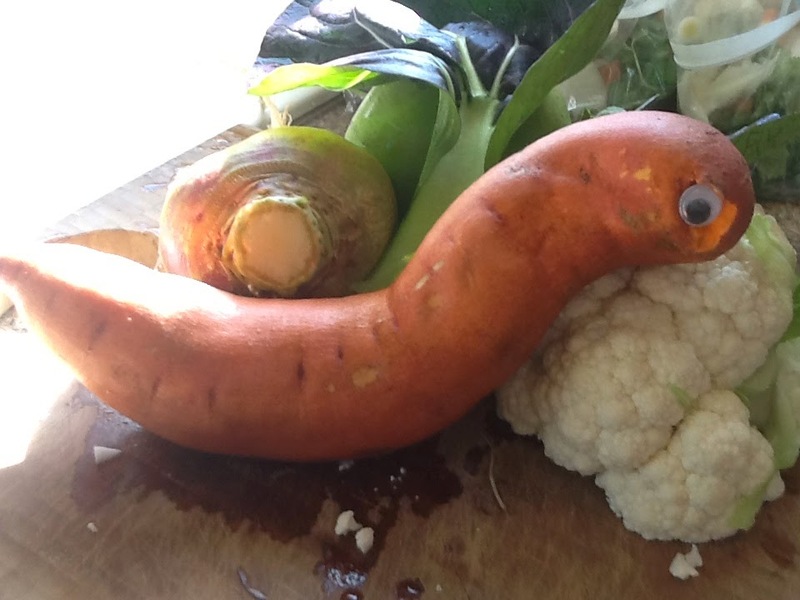 Sweet potato…. will be baked whole, juiced, or spiralized into “fries”.